The Republic of Armenia established a diplomatic mission in the United States in February 1992. Alexander Arzoumanian served as Charge d’Affaires ad interim (temporary chief of mission) until February 1993, when Rouben Shugarian was appointed the first Armenian Ambassador to the United States. Dr. Arman Kirakossian has served as Ambassador Extraordinary and Plenipotentiary to the U.S. since November 1999. The Armenian Embassy to the United States represents the Republic of Armenia and is working to promote strong and friendly relations with the U.S., playing an active role in advancing close and mutually beneficial ties in political, economic, military, commercial, cultural and other areas. The Embassy’s diplomatic staff is responsible for advocating Armenia’s political, economic and commercial interests with the United States Government and within multilateral institutions, such as the World Bank, International Monetary Fund, Organization of American States, etc. The Embassy’s activities are aimed at consolidating and strengthening the comprehensive ties between Armenia and the American Armenian community. The Embassy promotes awareness of ancient and rich Armenian culture, sponsoring and organizing concerts, exhibitions, lectures and presentations. 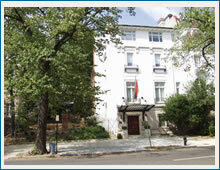 The Embassy provides variety of consular services to American and Armenian citizens.